The Hayman Fire was the largest in Colorado history, burning 138,000 acres and destroying 600 structures. In early June 2002, historical fire suppression, drought conditions, continuous, dry fuels along the South Platte River corridor, human carelessness, and a dry, windy weather system combined to create the perfect conditions for fire. The Hayman Fire was first reported just south of Tarryall Creek and Highway 77 near Tappan Mountain in the late afternoon of June 8, 2002. Low humidity, warm temperatures, and high wind speeds facilitated the fire’s hot temperatures and rapid spread along the South Platte River corridor. For 20 days, the fire consumed public and private lands southwest of Denver in parts of Park, Teller, Jefferson, and Douglas Counties. 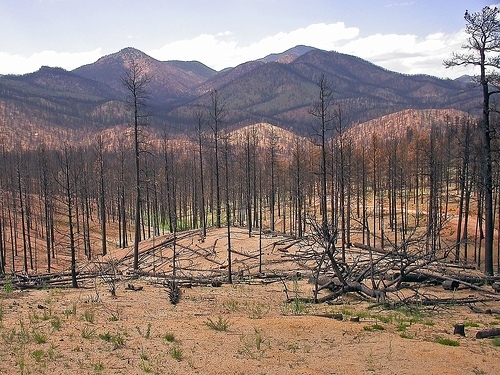 Learn more about the fire in the U.S. Forest Service’s Hayman Fire Case Study. 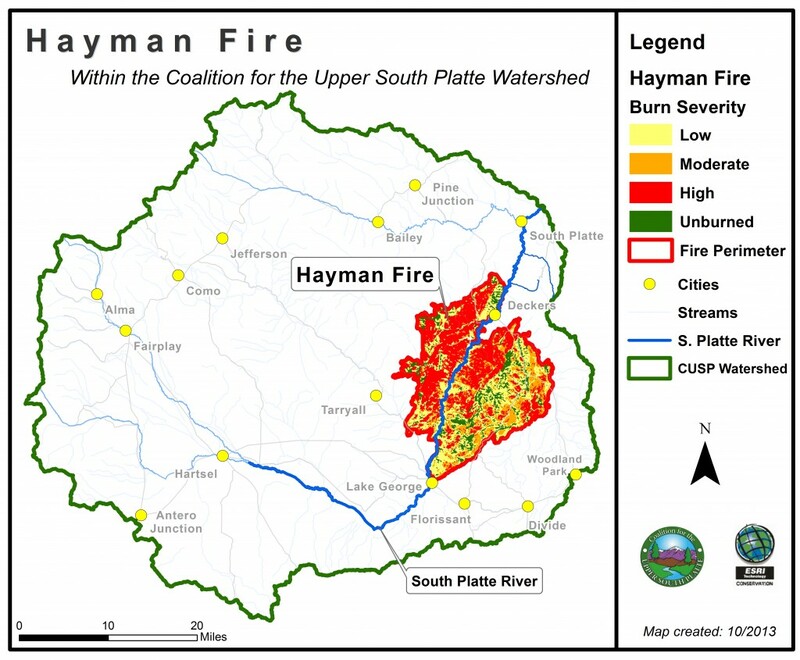 The Hayman Fire was fully contained in the Upper South Platte Watershed, but its impacts reach far beyond the bounds of the watershed. Intense post-fire flooding had devastating effects on communities, infrastructure, and water supplies. 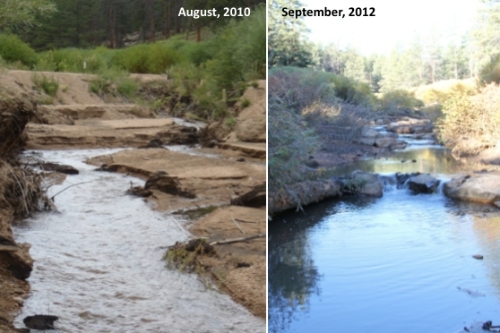 Sediment and debris flows damaged homes, took out roads, ravaged terrestrial and aquatic habitats, and degraded streams and rivers critical for water supplies in the Denver Metro area and further downstream. Over a decade later, the burn scar continues to impact the landscape communities, animals, and plants rely on. The land is healing, but it will take decades to fully recover. 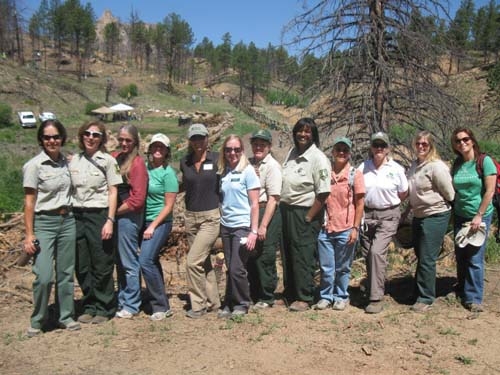 Learn more about the fire’s impacts in the Colorado Forest Restoration Institute’s Hayman Fire Research Summary. CUSP was involved very early on after the fire mobilizing thousands of volunteers to assist with post-fire emergency stabilization and helping local communities recover. We have worked with homeowners, government agencies, and other organizations ever since to prioritize and implement projects that protect homes, infrastructure, and water sources. We will continue to work across boundaries to restore public and private lands affected by the fire, and promote the growth of a healthy and resilient forest in the burn scar. The Hayman Fire burned intensely and has had devastating effects on communities and ecosystems. The fire drastically increased erosion and sediment entering the streams and rivers we rely on for drinking water and recreation. 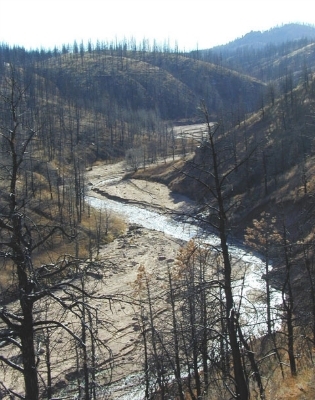 Catastrophic wildfires have long-term impacts on waterways and sediment movement. 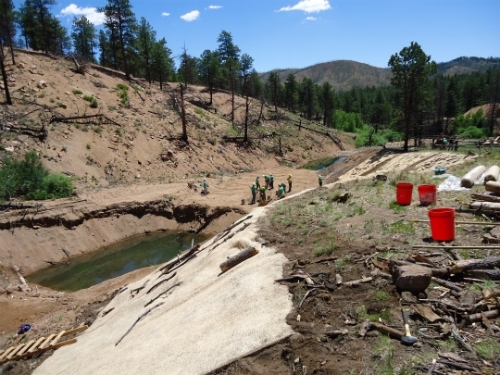 River restoration is a critical component of post-fire recovery. Volunteers help to stabilize slopes and re-vegetate areas affected by the Hayman Fire near Trail Creek. The large ponds are sediment detention basins that help slow stormwater and reduce erosion. CUSP volunteers have been assisting with recovery since shorty after the fire. Saplings are planted after the land has made a sufficient recovery to support new trees. Continuing to work with public and private partners is essential for longterm recovery and forest regeneration. The 2012 Hayman Remembrance Day brought many stakeholders together to reflect on the fire and celebrate a decade’s worth of progress. 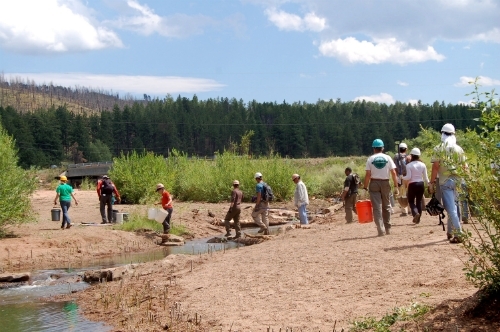 Over a decade after the fire, volunteers continue to stabilize stream banks and reduce erosion by planting willows. The Hayman burn scar will take decades to fully recover. Your continued involvement is critical for supporting healthy forest regeneration and high quality water in the burn scar and beyond. Funding is vital to support work that promotes healthy forest recovery, improves water quality, mitigates flooding, restores rivers, improves habitat, and protects communities. Your contribution is used to fund on-the-ground recovery work, equipment, materials, and seed and trees for revegetation. Your donation is also used as matching funds for federal, local, and foundation grants, thereby tripling your impact. 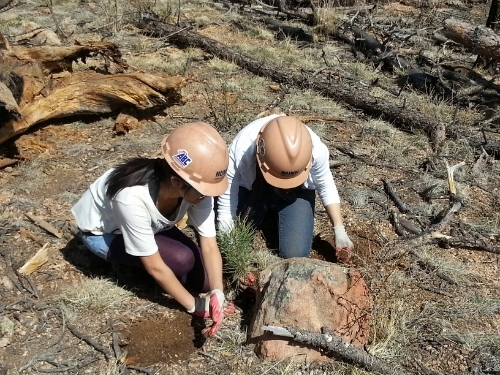 Sign up to volunteer today to support ongoing restoration efforts in the Hayman burn scar. Your help is crucial for a full recovery!